I believe that my kids should do no more than 3 activities at a time. It's a number that makes sense to my family and my husband and I are going to stick to it. Now we didn't draw that number out of a hat or say hey three seems like a great number, we really thought about what we want our family life to look like. We were intentional in our planning so our schedule allowed for more than just the kids' activities. Three activities may not work for your family, you may need just two or four depending on your family size. But I do think every family should come up with a number and stick to it. When our kids were younger we heard from our friends with school aged kids about how the kids' schedules rule their lives. Basically we were told to enjoy our free time now before our kid's schedules ruled our lives. We all know the parent that complains about how busy they are because of their kids' schedule. I'm sorry to burst everyone's bubble, but that is pure crap. You are the adult. You set the schedule. If it's really a problem, then say no. Your kids don't have to do something every single day, that was a choice you made. Please know that I think it's important for kids to play sports, dance, take music lessons, or whatever it is that your child is interested in. I just don't think it's the most important thing for a child. 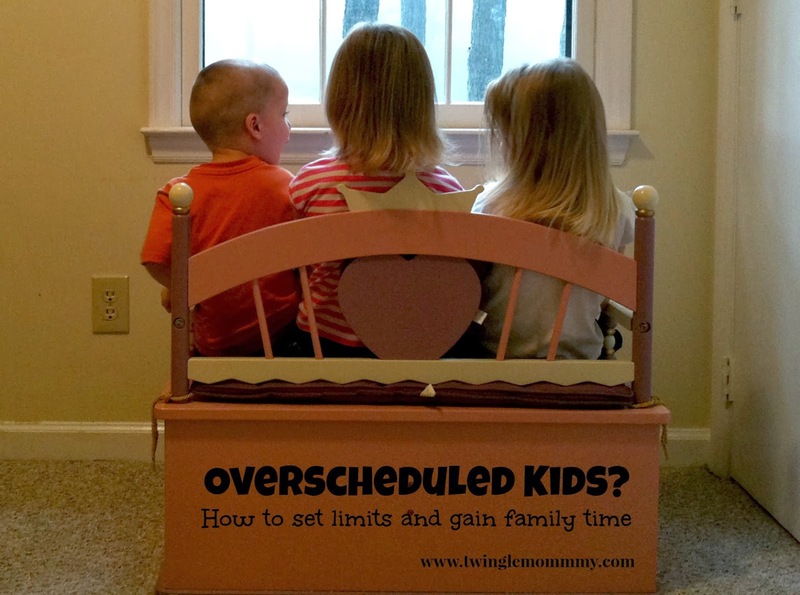 I firmly believe that most kids are overscheduled and their parents are exhausted. My husband and I want our kids have down time. We do not want them running from activity to activity only to come home and rush through dinner, bath, and homework before they get to bed. We want to sit down and have dinner as a family. We want our kids to play in the backyard and have some unstructured fun. I've been told that makes us old fashioned, I'm OK with that. These are my kids activities. Yes school is an activity. Most parents don't include school but it needs to count. Not only do kids have homework every night but they spend most of their day in school, why wouldn't you count it? I like our schedule since it means we are free 3 afternoons during the week and 4 evenings a week. This gives us time to be together as a family. I understand that there are many parents out there that think their kid needs to be enrolled in sports, music, art, dance, and a foreign language so they'll be exposed to everything. Trying to expose our kids to every opportunity is a recipe for disaster. Not only is it expensive, but it's also unfair. In reality, the kids are given a multitasked, high stressed, adult paced life in lieu of a childhood. I don't believe cramming all those activities into your kids' schedule is worth missing out on a childhood and family time. You don't get these years back. It's OK to say no to an activity. Is it easy? Of course not, but you are the one setting the tone for your family. Our kids know that if they want to try something new, it means something old has to be dropped. We sign up for the season and when the season is over they can resign up or try something new. Or in Molly's case, say you only want to do Awanas. It's really simple, if you don't want to be so busy with your kids' activities, then start putting limits on what they can sign up for. Thanks! It is hard trying to juggle schedules. I hope my kids want to play an instrument one day, except the dreaded recorder that's required in 3rd grade. We shall see what they want to do. I'm totally with you! I want my kids to participate in activities, but not ALL THE TIME. It seems like every other week my eight year old comes home with a flyer or paper for some activity to join, but I say no. He's eight - he's got plenty going on right now with school and tae kwon do. Our elementary school is the same way. But we just say no since she already picked her activities. My son is about to resume in a new school and I have been thinking seriously of less extra-curricular for him. This has helped my decision, thanks a lot. I like that you count school as an activity. It's where my kids spend most of their time and they have homework(well, 2 of them do). We try to do only 1 or 2 others. Because it all adds up time and moneywise when you have three kids! Right now, two of mine just have soccer as their extra activity. My oldest also has running, which is easy b/c he just stays after school 2 days a week and it requires no extra running around for me. For a few weeks, soccer, basketball(3 three played), and running overlapped. Those weeks were exhausting! The overlapping is the worst! We had that with our oldest with two sports which wouldn't have been too bad but our son was in 3 therapies at the time. I lived in the car, I was miserable, but I learned a valuable lesson. Never again will I allow us to be that busy which is hard with three kids. I'm so grateful that at least there is one activity that they all do together. And the bonus of Awanas is that it's at night so my husband and I get a date night. My activity limit is two. Not only do the kids start to get burnt out but I know that I get burnt when I have too many things on my plate. My kids (ages 4.5 and 2) don't have any activities yet, except my oldest is in preschool. We were going to start her in dance last fall, but thought it would be too much with preschool 4 days a week. Our limit will probably be 2 activities if they go to school and 3 if they are homeschooled. We'll see. I did 0 activities as a kid because my parents couldn't afford them. I begged for dance, piano, and swimming lessons. I started flute in the 4th grade, but that was during school, so it wasn't extra curricular. In high school, though, I was jammed packed with activities: chorus, theater, band/dance, church activities, and about 10 different clubs, haha. But I think it worked out great for me at that age. That's definitely too much for little children. I agree, I think it's too much for little kids. I think it's great to set limits and see how it goes for your family. You can always make adjustments down the road. I'm so glad that cutting back was a good experience for your family. It was for ours as well. I think it's hard saying no in the beginning since you can't see the reward. Once you see the reward you don't want to go back to your old ways. Thanks for you blog. #SITSBlogging. Wish you and your family a happy life and Good luck. This is a challenging balance, especially as children get older and their interests diverge. Depending on the region of the country you live in, field time can be limited, so that can mean sports take place into the evenings and on Sundays. I agree that being intentional with every decision to add an activity is very wise, and being aware of the needs not only of the individual child, but of the family as a whole is critical. The diverging interests will be tough as they get older. Right now my kids really like the same things which makes it much easier. Also, forgive my ignorance but what is "Awanas"?? The best way to describe it- it's a biblical version of scouts. The kids attend once a week and meet with their group. They learn Bible stories and earn points/badges for learning verses. The kids play games and go on outings occasionally on weekends as well. And don't feel bad about not knowing what it is, I didn't before I had kids. But they love it and my husband and I love that we can have a date most Wednesday nights. We volunteer a few times a year. I've limited my daughter to two weekly activities, both which we completely take the summer off from, and one "extra" activity (pageants - usually 1 a month). I can't handle more than that personally, plus I know that she really needs downtime at home too. We are taking the summer off too. Except for vacation Bible school which is a half day program for a week. My daughter asked to attend dance camp but I decided against it. I'm really looking forward to a lazy summer without a schedule. Plus I agree my kids need some downtime, me too! I absolutely agree...kids need to be limited in their activities. It gets to be way too much for both the kids and the adults, and then no one has any real fun. On a side note, I’ve been pretty sure that I’ve wanted my kids involved in at least one active extracurricular throughout the year. It’s probably just me passing along my paranoias from my own childhood, but it’s good to encourage active extracurriculars. Well, I'll be the only one here to disagree...I have 3 very active kids-2 girls, 1 boy. They each have school, Scouts, 4-H and dance lessons. Then during various sports seasons, they are involved in basketball, volleyball, football, soccer, cheer and baseball/softball. They take swimming lessons each summer. I work FULL time. Our schedules are hectic. But this is the reason I disagree...we spend more time together talking on the way to activities than we do on our downtime. We attend each other activities as a family. We don't do extravagant vacations-we do weekend hotel trips to tournaments and find a fun activity like a waterpark or zoo for the day before or after. The activities are our family time and supporting each other is vital. I can have a day off in 15 years (my youngest is 5). But until they are out on their own, I will do everything in my power to give them every opportunity that I can and spend every minute I can with them. I coach the teams I can, I attend the other practices I can. They are great about telling me what they want and don't want to do-so their activity choices are about 95% their own, I'm honest when I say I do try to persuade various activities-and 4-H is a non-negotiable item at the beginning-it teaches too many vital life skills not to try! But they're allowed to try anything they want and after the season, they're allowed to not sign up again if they want. But we've only found a couple of activities they haven't enjoyed, so we're loving our crazy life!